January 19, 2017--December's instructions covered couching Kreinik thread across the dividing lines of each section. Lots and lots of couching. It's now done and ready to be finished into a pillow. It's a really lovely design. PS: Decided at the last minute to fill in the very center of the design with the lightest shade of blue using T-Stitch. Ahhh, much better. November 15, 2016--November's blocks, the last ones, are stitched. Something tells me December's instructions will be to couch Kreinik thread around each section. Plan on making a pillow out of this pretty SOTM. It's visually interesting how the corners look like dog ears even though they are even with the other areas. I also like the way the center recedes into the background as if you're looking down into a box. Cool. November 2, 2016--Block 10 for October is complete. Chose beads from my stash which are in the mid-range of the blue colors. Like how they look. September 15, 2016--Finished stitching blocks 8 and 9. Started block 8 in August, but ran out of thread and time before seminar, so now that I've been back for almost two weeks, had some time to work on this project. The last color seems to jump from medium blue to a very pale blue, but I believe it's because the prior color has a darker blue laid on top of the lighter one. The next two months should make the colors look different again. July 7, 2016--Block 7 for July is done. The corner units stitch up quickly and they are all the same size except for the ones on the last row. It looks so much better in person. June 21, 2016--June's Section 6 is stitched. It took longer than it should have because I ran out of thread. Got it in time to finish up in June. Moving into the pale blues now. Like how it's developing. May 4, 2016--Section 5 for May is done. It's interesting how different the colors are when placed next to others. 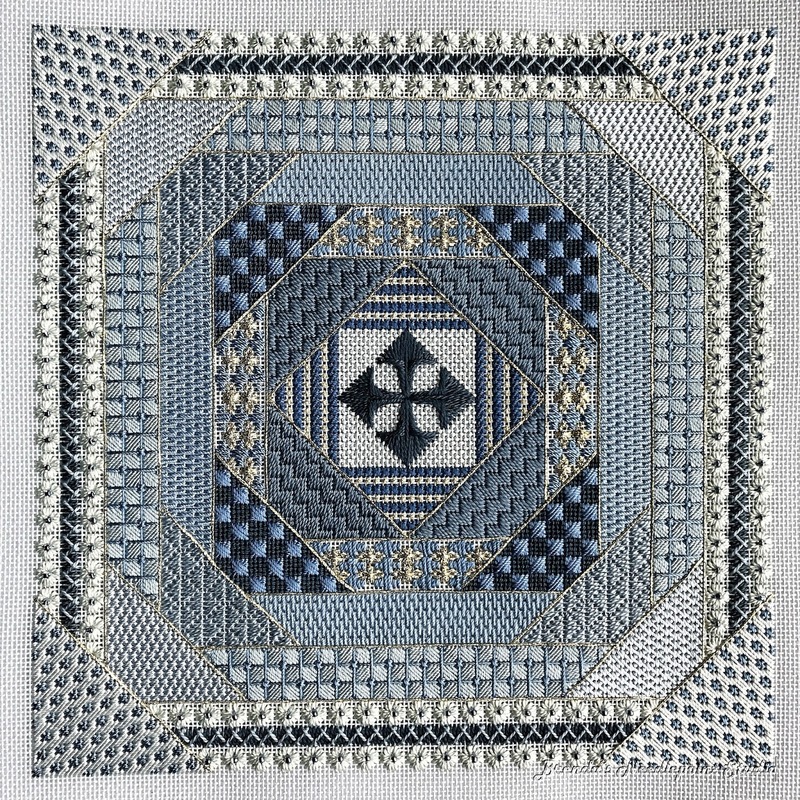 For example, the dark color used in this latest grouping is the same thread used in the very center, but it appears a bit bluer. Also, the light blue color in this section appears darker than the one used last month, but it is in fact a bit lighter. Must be that they're different threads and reflect light differently. April 18, 2016--Section 4 for April is done. Was able to do most of the stitching while attending the 6th Annual NJ Needle Festival last weekend. March 7, 2016--Completed the stitching for March, Section 3. A quick and easy section. The photo was taken late in the afternoon with the sun low in the sky. Makes a difference in how the blues appear. February 6, 2016--Section 2 for February is done. The two blues seem to be fighting each other right now, but I suspect that as more sections are completed, they'll meld together nicely. 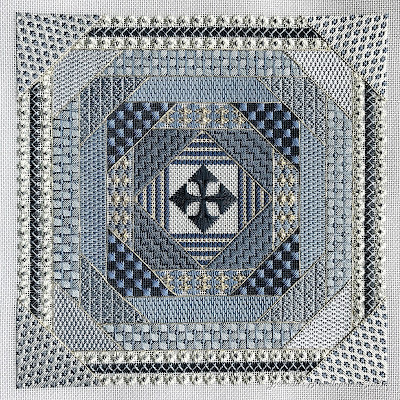 January 30, 2016--January's Block 1 is stitched. I made some changes to the Amedeus stitch because I used perle thread instead of multiple strands of thread. Below is a photo of what the Amadeus stitch looked like before I added a long thread down the middle to hide the "open area". The two arms on the right and left side have a long stitch down the middle to cover the open area while the upper arm does not. I also diverted from Susan's instructions by stitching the right side first, then the left. I found it difficult to work left, right, left, right--could not see the holes in the middle. Also, did not want to "pierce" the perle thread like you can do with stranded. I'm pleased with the result. Can't wait to start February's Block 2. PS The light threads you can barely see on the canvas are basting lines. January 23, 2016--A few days ago some members of the ANG Delaware's Seashore Chapter and I drove up to Fireside Stitchery in Pennsylvania to purchase the necessary threads to stitch this year's ANG Stitch of the Month (SOTM) project. This beautiful design by Susan Hoekstra, called Feuilles d'Ananas (Pineapple Leaves), is a study in values requiring 11 different threads from dark to light. 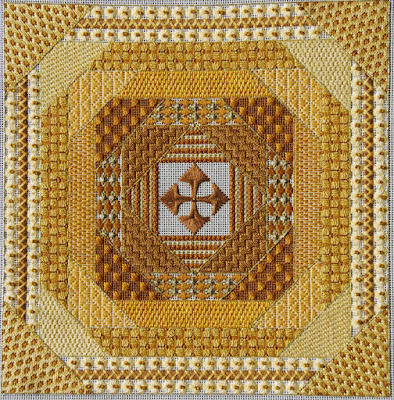 What fun we had comparing our color choices to Susan's dark golds/topaz to light straw colors (see project photo below). I love blues, so naturally migrated to those colors and below is a picture of my thread selections. Those of us in the guild who are stitching this year-long project plan on meeting once a month at each other's home to help with any challenges we may have. Looking forward to stitching the first block this month. I LOVE, LOVE, LOVE your colors. I am definitely not a gold person, so the blues seem perfect to me. Thanks Arliss. Look forward to seeing your color choices. Brenda, love your blues. I've decided to do this on blue canvas with ecrus and reds as my colors. Wonderful chance to use stash and be creative, and Susan's designs are always interesting. I too am stitching this on a very pale blue canvas. Your colors sound wonderful. Looking forward to seeing pictures. Love your colors! I was going to choose Aqua to teal, then remembered that I have far too many projects for this year already! Hi Liz. There are never enough projects. LOL. This looks like fun. I love the different shades. Nice colors & good choice to add the center thread! I forgot that it was February already. That's interesting as the colors all looked good lined up in value order. You could always rip out the center if they don't meld as you progress. 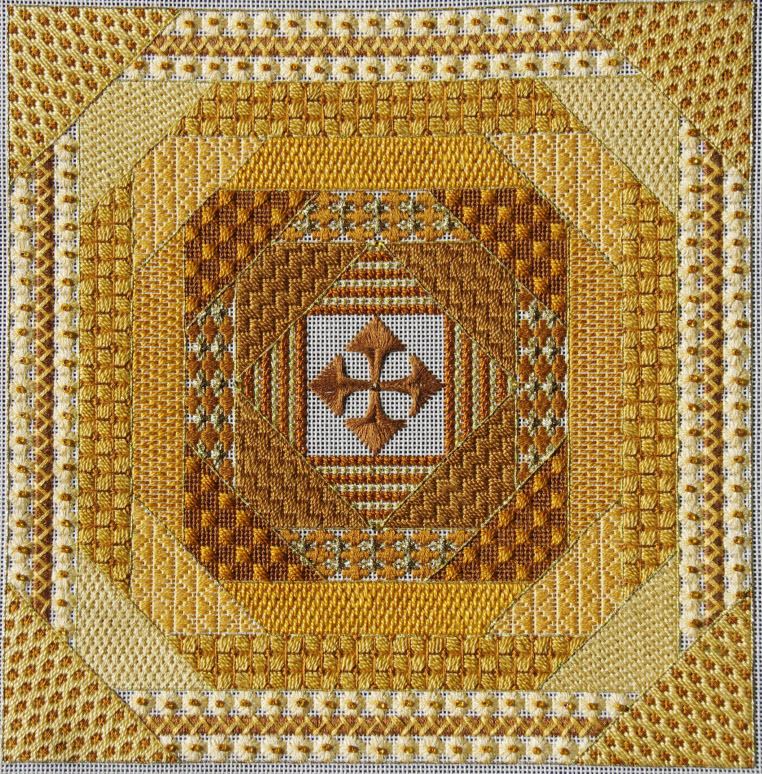 In July's triangles, did you go over the single threads twice for better coverage as in bargello designs? I didn't do that since the DMC Perle seemed thick enough, and the over 1 sits up just fine. Thank goodness.